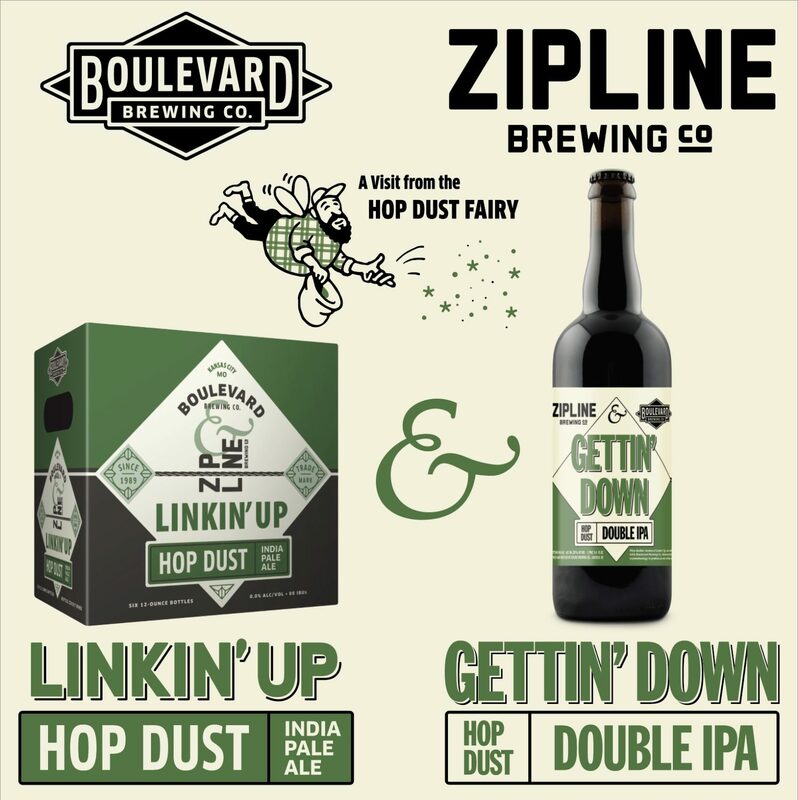 Linkin' Up & Gettin' Down - Zipline Brewing Co.
April 25, 2018 – Kansas City – Boulevard Brewing of Kansas City, MO and Zipline Brewing of Lincoln, NE today announced the approaching debut of a unique collaboration. As the basis for experiments in adventurous IPAs, the brewers employed lupulin powder, aka hop dust, to create two flavorful, complementary limited release beers. Boulevard’s Linkin’ Up Hop Dust IPA and Zipline’s Gettin’ Down Hop Dust Double IPA will hit shelves and taps throughout the breweries’ home markets in early June. Each brewery put its own spin on the concept. Boulevard’s Linkin’ Up includes a liberal dollop of hop dust and a medley of favorite varietals that deliver bright, juicy notes of pineapple, mango and bubble gum. Linkin’ Up will be available in kegs and 6-packs of 12-ounce bottles. Zipline’s bold Double IPA, Gettin’ Down, will roll out in kegs and 750ml bottles. It features Galaxy hops and Mosaic hop dust to produce a dank flavor profile of lychee and tropical fruits for what Zipline hopes is an out-of-this-world experience. A number of events are in the works for Lincoln and Omaha, Nebraska, and the greater Kansas City area. Check the breweries’ websites and social media channels in the coming weeks for details. Boulevard Brewing Company is the largest specialty brewer in the Midwest, dedicated to the craft of producing fresh, flavorful beers using traditional ingredients and the best of both old and new brewing techniques. For more information, visit boulevard.com or follow us onfacebook.com/Boulevard, twitter.com/Boulevard_Beer and instagram.com/boulevard_beer. Zipline Brewing Company crafts artisan ales and lagers with high quality precision in Lincoln, Nebraska. Zipline was born from the founders’ innate sense of adventure and their desire to connect with the thrill-seeking spirit in all craft beer fans. Our approach is clean, simple, and direct to help you focus your energy on enjoying Brave New Brews. For more information, visit ziplinebrewing.com or follow us onfacebook.com/ZiplineBrewing, twitter.com/ziplinebrewing and instagram.com/ziplinebrewing.